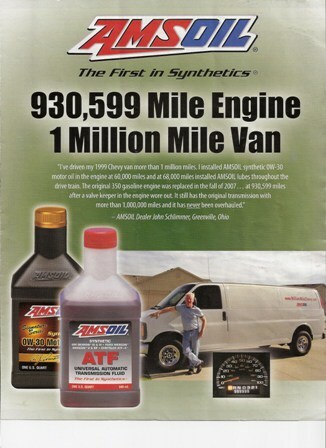 Amsoil Dealer John Schlimmer of Greenville, Ohio…drives a 1999 Chevy G-3500 Express delivery van over the road between 110,000 to 120,000 miles a year. 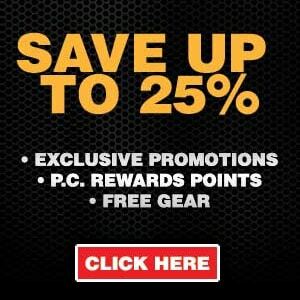 When Schlimmer learned about AMSOIL synthetic motor oils and lubricants in 2000, he installed AMSOIL products through-out the vehicle’s drive train at 68,250 miles.After installing the Amsoil 0W-30 Synthetic Motor Oil, he went from changing his oil every two weeks to once every three months. 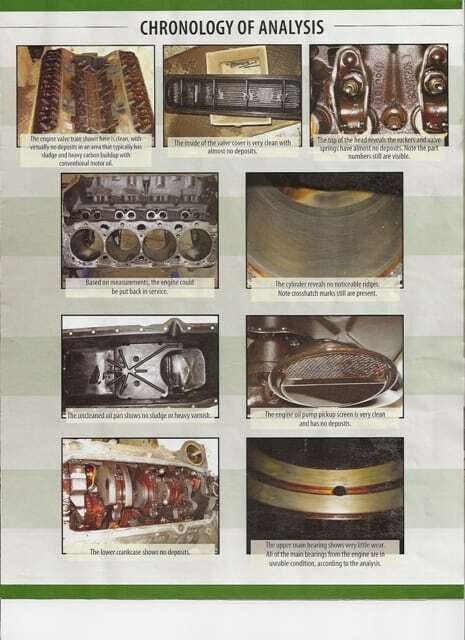 In October, 2007, a valve keeper broke on the 5.7 liter, 350 gasoline engine. Schlimmer said the actual mileage on the engine did not factor in more than 6000 hours of idle time. 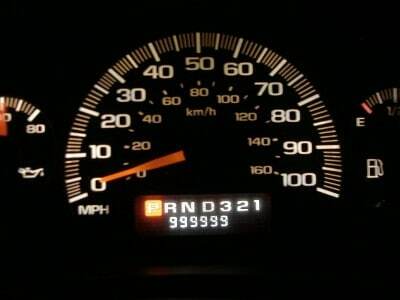 It had 930,599 miles on it. 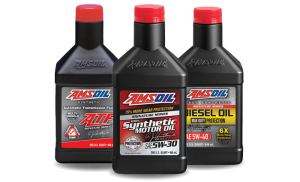 Schlimmer sent the engine to AMSOIL Inc. for analysis. Analysis showed that a valve keeper had worn out, causing the valve to become wedged in the chamber. The problem with the engine was not oil related. Measurements taken against the manufacturer’s specifications indicated the engine was still in useable condition. In each of five categories, the engine tested within 1 percent of manufacturer’s original specifications for the engine. Schlimmer replaced the engine and continues to drive the van with the original transmission still running smoothly at over 1 million miles of service. I Would Never Have Replaced It! how clean the valve covers, rocker arms and oil pan are. This engine had well over 6,000 hours of idle time…due to my sitting and waiting to pick up another delivery. In the heat of the summer…I would idle the engine with the AC running to cool the inside of the vehicle…and in the winter time I would idle the engine with the heater running to warm the inside of the vehicle. Click here for brochure. If you read about overheating this engine on the homepage…that was a big factor weighing in my mind when I made the decision to replace the engine. I remember thinking that day…If I do a valve job…cost $2000…then what happens if I have more issues in the near future. How much money do I want to throw into this engine. And the main factor was…I cannot afford to have breakdowns. The freight I haul is very time sensitive. Reason being…that when a line goes down at a manufacturing plant due to a broken down machine…it can cost the manufacture over $10,000 an hour for each hour they’re down! And the kicker is…if you don’t deliver on time…the manfacturer can come after you for lost income! You be the judge. Click here and zoom in to see for yourself…just how squeaky clean the entire engine is after 930,599 miles! Looking at the pictures and specifications of my engine was bitter sweet. The sweet part was…looking at the pictures of the engine…I was amazed at how clean it was. Especially the bottom of the oil pan and rocker arms. WOW…what a pretty sight! And then when I read the spec page…that was a bitter moment for me! Bitter because after seeing how little wear there was throughout the engine…and all that was wrong with the engine was a valve keeper wore out. I knew at that point…I could still be drving that engine down the road today. Then Why Are You Changing It Every 3-5000 Miles? Keep in mind…what you’ve just seen and read about this engine…was accomplished by changing the engine oil every 25,000 miles. And what makes this even more significant…the Amsoil company had no idea I was on this million mile journey until around 900,000 miles! Because I know your vehicle is your “pride and joy.” It becomes like an ole shoe to you. It takes you to work each day…keeps you warm in the winter and cool in the summer. 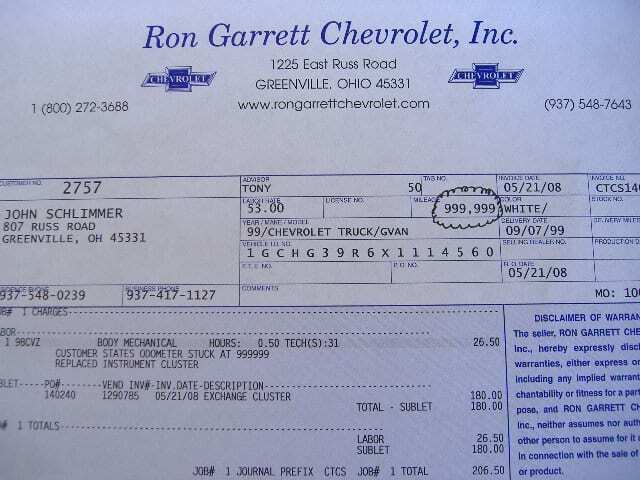 Many of you make a living out of your vehicle…like me. I know how important it is to be able to hop into your vehicle when it’s 20 below and turn the key and the engine starts right up. Or when it’s a hundred degrees and you’re stuck in a traffic jam and the engine and transmission oil are not overheating. That is just a few of the many benefits of Amsoil synthetic lubricants. So if you still think your oil is so good…then explain to me…why are you still changing it every 3-5000 miles? Knowing what you know now? Another unique story is my “Million Mile Transmission.” I wonder if the Amsoil synthetic automatic transmission fluid has anything to do with that?